Charlap Hyman & Herrero's first solo exhibition, Ouvrez-moi, is a site-specific installation of new work held by ALMA ZEVI Projects in Venice, Italy and organized by Clara Zevi. Located in a former Venetian mirror workshop steps away from the main gallery, in Salizzada Malipiero 3208, the installation comprises a bedroom fully furnished with works made by CHH in collaboration with local craftsmen in Murano. Referencing a scene in Jean Cocteau's 1932 film, The Blood of a Poet, in which a mirror turns to water upon the command ‘ouvrez-moi’, CHH’s mirrors become lamps, vases, vitrines, and aquariums. Coinciding with the 2019 Venice Biennale, Ouvrez-moi will open with a public reception on May 7th, 2019 and be on view from May 3rd, 2019 through July 6th, 2019. Charlap Hyman & Herrero has designed Tina Kim Gallery's booth at TEFAF Maastricht, open from March 16th, 2019 to March 24th, 2019. The booth, architecturally considered for the New York art gallery's exhibition needs, will be located at Stand 512 in Section TEFAF Modern. Charlap Hyman & Herrero has curated four paintings on canvas by Pilar Almon for Green River Project LLC’s Cabinet Show, opening March 9th, 2019 from 6:00 PM to 8:00 PM. A series of wall-mounted cabinets handmade by Green River Project LLC co-founders Aaron Aujla and Ben Bloomstein will hang in the furniture design studio's storefront, each filled with displays arranged by different contributors. They include: Asp & Hand, Michael Bargo, Emily Adams Bode, Raquel Cayre, Suzanne Demisch, Karma, The James Rose Center, Nick Sethi, Giancarlo Valle, and Carolina Vogt. Charlap Hyman & Herrero is honored to be featured for the second consecutive year among The Architect’s Newspaper’s “Top 50 Interior Architects,” released in their March 2019 issue. Charlap Hyman & Herrero has designed Friedman Benda’s exhibition, Blow Up, curated by Felix Burrichter, founder and editor of PIN-UP Magazine. 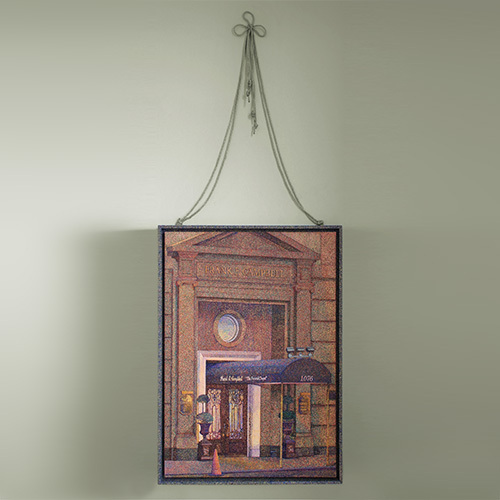 With large-scale watercolor panels, the firm has transformed the gallery into a sort of "re-rescaled" dollhouse for the exhibition, which features modern and contemporary works of art and design. Blow Up engages with aesthetics of scale, along with themes of youth and domesticity. The exhibition will open with a public reception on Thursday, January 10th, 2019 from 6:00 PM to 8:00 PM and remain on view until February 16th, 2019. Principal Adam Charlap Hyman will join PIN-UP Magazine editor-in-chief and founder Felix Burrichter and Princeton University professor Daniel Sherer for a conversation on the design legacy of Luigi CacciaDominioni at The Salon Art + Design fair. The discussion of the Milanese architect and furniture designer will take place as the Park Avenue Armory, 643 Park Avenue, from 3:00 PM to 4:00 PM on Sunday, November 11th, 2018. Wallpaper, rugs and furniture by Charlap Hyman & Herrero will be featured in a pop-up space at Barneys New York. The space will be on the 9th floor of the Madison Avenue store from November 1st, 2018 to November 15th, 2018. 1076 Madison, a solo exhibition of artwork by Cynthia Talmadge, designed by Charlap Hyman & Herrero, will open with a reception on Friday, November 2nd, 2018 from 6:00 PM to 8:00 PM. The exhibition will take place at 56 HENRY, at 56 Henry Street, New York, and will be on view through December 23rd, 2018. 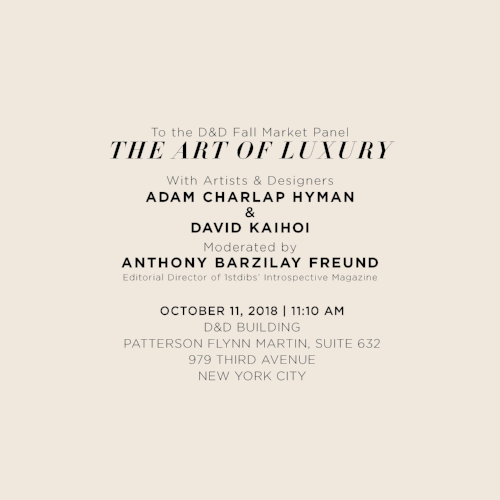 Principal Adam Charlap Hyman will be speaking with fellow designer David Kaihoi on the D&D's Fall Market Panel, The Art of Luxury, moderated by Anthony Barzilay Freund, editor of 1stdibs' Introspective Magazine. Adam will discuss the firm’s understanding of what luxury means today and how it is a part of CHH’s architecture and design practice. The event will take place in Patterson Flynn Martin's showroom (Suite 613) at the Design & Decoration Building at 979 Third Avenue, New York, on October 11th, 2018 at 11:10 AM. Charlap Hyman & Herrero has been selected by Studio Cadena to participate in a 24 hour-long installation at Storefront for Art and Architecture in New York. CHH's program will take place from 3 AM-7 AM on June 21st, 2018, with design firms Leong Leong, Jerome W. Haferd & K. Brandt Knapp, and Chen Chen & Kai Williams. Charlap Hyman & Herrero has designed the sets for Cincinnati Opera's The Coronation of Poppea. Claudio Monteverdi's baroque masterpiece, directed by Zack Winokur for one of the nation's oldest and most highly regarded opera companies, will premiere on June 21st, 2018 at 7:30 PM. Charlap Hyman & Herrero formally launched its collection of rugs with Patterson, Flynn & Martin at a reception at PUBLIC Hotel in New York. The hand-woven abaca rugs are available to the trade through Patterson, Flynn & Martin, and to the general public through CHH by visiting our Products page. Charlap Hyman & Herrero is honored to be featured among The Architect’s Newspaper’s “Top 50 Interior Architects of 2018,” released in their March 2018 issue. Principal Adam Charlap Hyman will be speaking about CHH’s installation for the holidays, White Rain, with other architects who have recently contributed to the Miami Design District in a panel moderated by PIN-UP Magazine’s editor, Felix Burrichter. Charlap Hyman & Herrero designed the set for SSENSE's photo shoot, Thom Browne's Corporate Playground: Pursuing Work/Life Balance with Thom Browne Fall/Winter 2017.